Jeb Bush and Marco Rubio warred Tuesday over a new ad from Bush’s super PAC that accuses the Florida senator of skipping national security hearings in favor of fundraising trips. “Politics first: that’s the Rubio way,” says a narrator in the ad from the Bush-affiliated group Right to Rise, which plans to spend $1.4 million on television ads in Iowa over the next two weeks. The ad notes that Rubio missed a November 18 briefing for all senators in the wake of the Paris terror attacks. "Marco Rubio was missing, fundraising in California instead," the narrator says. The Rubio team shot back aggressively, deriding the claim as “intellectual dishonesty” because the ad fails to mention that Rubio attended a higher-level security briefing on the same topic on November 17. Speaking after an event in Clinton, Iowa, Rubio called the attack "not accurate" and said that Bush has become "increasingly negative" in his attacks. "As a member of the intelligence committee, I have access to intelligence information that isn’t even shared with others that are not on the committee," Rubio argued. "Millions and millions of dollars of spending have not changed [Bush's} fortunes and he’s become increasingly negative in his attacks," the Florida senator added. "This is not new." 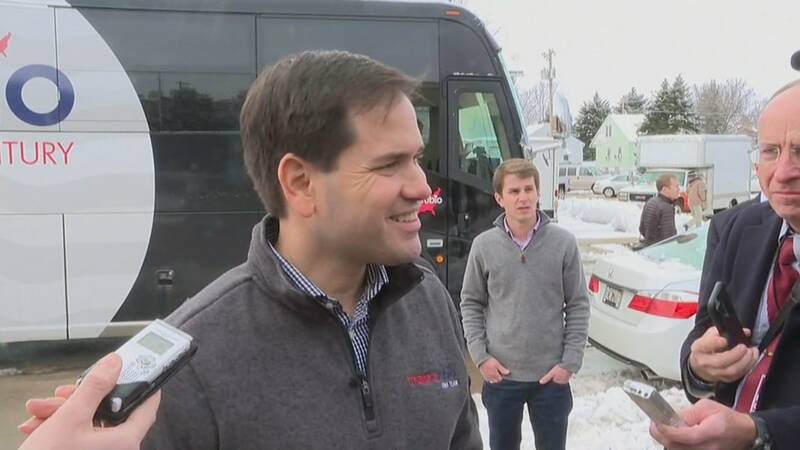 Rubio's team began striking back early Tuesday when the ad was made public. “Bush's team dishonestly omits that Marco is on the Senate's Intelligence Committee, where he attended the highest level briefings on the Paris attacks,” said Rubio spokesman Alex Conant. “No other candidate for president has received more classified Intelligence briefings or better understands the threats facing our nation today than Marco. It's sad to see Jeb's ‘joyful’ campaign reduced to such intellectual dishonesty." And Rubio aide Joe Pounder tweeted that Bush was also fundraising on December 2, after the San Bernardino shootings. Right to Rise official Paul Lindsay shot back: "The Rubio campaign is correct that Jeb Bush is, indeed, not a U.S. Senator and has not skipped critical top secret national security briefings to fundraise." At the time of the briefing, an aide told NBC News that Rubio skipped the November 18 meeting because he had attended a Senate Intelligence Committee briefing the previous day, which Rubio’s staff said included more in-depth classified information than what is shared with all 100 members of the United States Senate. Rubio has come under fire for missing votes in the Senate in favor of campaign events. The Florida senator has countered that other previous presidential candidates also played hooky from their Senate jobs during the heat of the campaigns. Another GOP candidate, Gov. Chris Christie, also took Rubio to task Tuesday over his record on missing Senate votes. "Dude, show up," he told voters at a town hall in Muscatine, Iowa. "Vote. If you don't want to, quit." Asked to respond, Rubio shot back that Christie himself has been absent from his home state during the campaign. "Chris has been missing in New Jersey for half the time," Rubio said. "Candidates, I think, as we get down the stretch here, some of them get a little desperate and a little nasty in their attacks," he added. "And that’s fine, we’re going to continue to campaign on what I'm going to do when I'm president. "